Another Free family event in the school holidays in New Brighton! 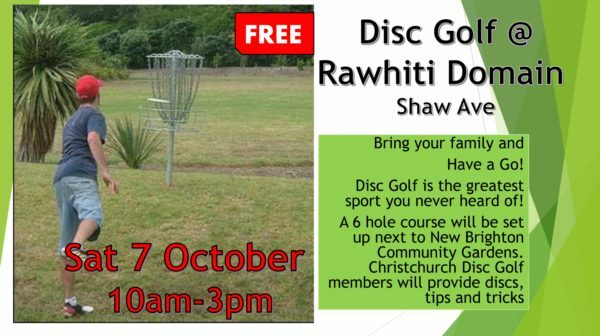 Disc Golf is the greatest sport you have never heard of, and it could come to Rawhiti Domain in the form of an 18-basket course; a free-to-use facility located in the East of the city. We will have half a dozen short holes set up on the day, and it will be entirely free of charge, disc’s provided too! You will have a chance to engage with Christchurch Disc Golf​ members and have all your questions answered. Click ‘interested’ or ‘attending’ on the event below to remind yourself on the day. No bookings necessary, just turn up.